One of my goals for the New Year was to push myself in the kitchen a bit more. Changing our diet in October to help lower Roo’s cholesterol levels was a challenge all in itself, but participating in the VeganMoFo Monthly Iron Chef Challenge seemed like a great way to get out of my comfort zone. That is, reading cookbooks, blogs, etc. and adapting those recipes to meals both Roo and I could enjoy. The rules for the Challenge are pretty simple in that there is only one rule: make an original dish. It can’t be something that you’ve previously posted that happens to involve the “secret ingredient” or be from, for example, a cookbook. The “secret ingredient” this month was squash. To be honest, I knew right away I wanted to make a dish with kabocha, but how I was going to do it was a little beyond me. Growing up, my mother would make kabocha squash for me, braised with a bit of kombu, mirin, shoyu and sake, served in one of her kiln baked bowls; little bare spots that the glaze didn’t cover that I still remember felt rough under my small, clumsy hands. It remains as one of my favorite meals today. But, it wasn’t original enough, and left me stumped for the Sunday night deadline. Thankfully, being a creature of habit, I went to Chinatown this weekend, and couldn’t help myself but go into bakery after bakery and see what pretty little pastries they had on display in their cases. Sponge cake, pineapple buns, swiss rolls (these were a favorite of mine as a child) and mochi cake. Mochi cake sparked memories of my mother waiting for us in the kitchen on winter afternoons after school; plates with squares of broiled mochi, browned and burst open, wrapped in squares of toasted nori and a drizzling of shoyu. If you’ve never had mochi before, I suggest trying it first before making this cake. The texture alone is something to be cautioned, as it is quite chewy. If you can get past that, it is seriously worth it. I can’t explain how delicious it is, other than glutinous rice is a huge comfort food for those from Asian heritage. It’s like…what the potato is to the Irish. Cake made with mochi is a sweet, sticky, glutinous dessert. It’s very popular during Chinese New Year and typically steamed. I however wanted to make it a bit less sweet (more to Japanese taste as my mother would be receiving leftovers) and bake it as I didn’t have access to a steamer. 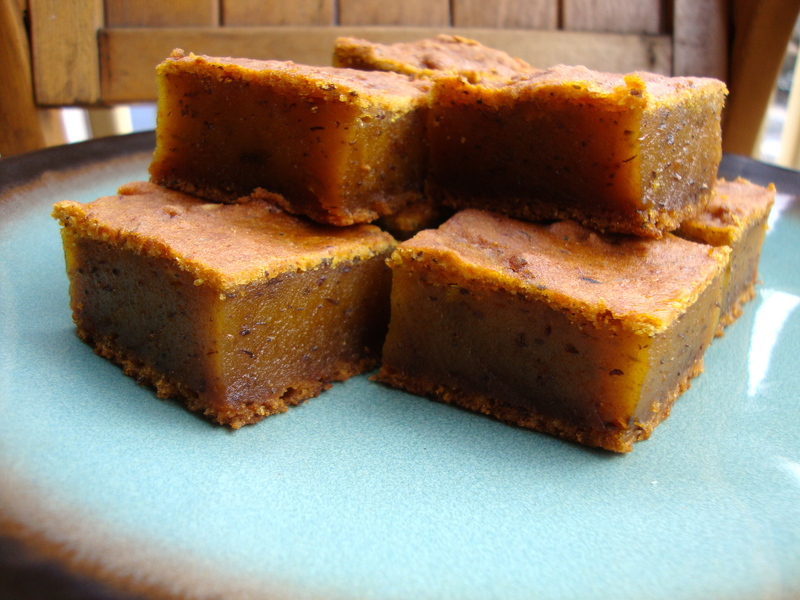 What resulted was a lovely thin crust surrounding the lightly sweet, kabocha filling. I also love that you can see the tiny flecks of ground flaxseed, which do add a slight nutty taste to the cake. Mochi will always be a comfort food for me. But on days that I’m craving something a little sweet to go with a cup of sencha tea, this will be one of the first things I’ll go for. Place your oven rack to the middle position in the oven. Preheat the oven to 350F. Add your wet ingredients to you stand mixer and mix till well combined. Be sure to use your spatula to scrape down the sides of the bowl, down and back up. In a medium sized mixing bowl, add the dry ingredients and whisk till well combined. Add the dry ingredients to the wet and mix till well combined. Scoop out the batter into your cake pan (either lined with parchment paper or very well greased). Bake the cake for at least an hour. At the 50 minute marker, use a cake tester (a toothpick, fork, knife, etc) to insert into the middle of the cake to see if it’s done. If it comes out clean, it’s done. If not, continue baking the cake and check it every five minutes till it’s done. You must, I repeat, you must allow the cake to cool completely before removing it from the pan. If you do not, it won’t come out cleanly. Trust me, I love eating cake right out of the oven because I have the patience of a five year old. You must must must let this cake cool. This sounds delicious. Mochi and kabocha are longtime favorites around here, so of course I like the idea of having them as part of the same creation. 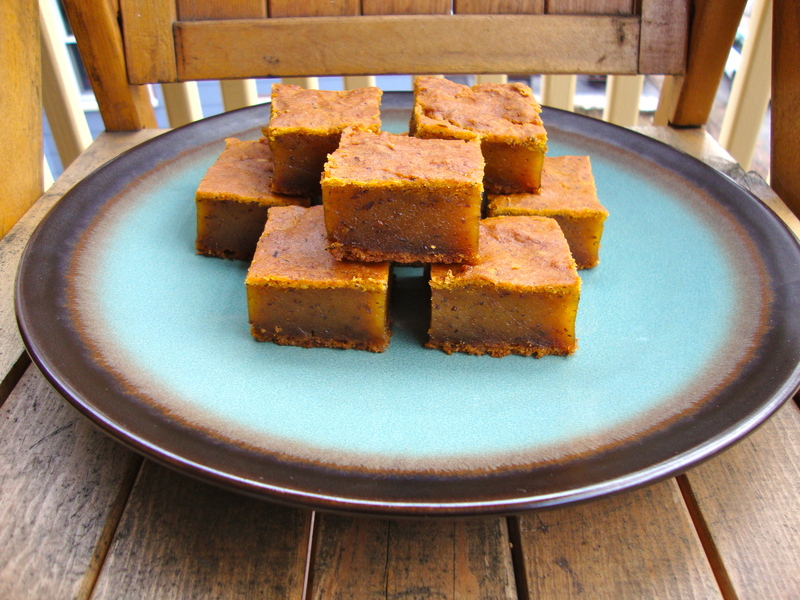 This recipe reminds me of the kabocha mochi I somewhat recently tasted for the first time–loved it! I don’t know what it is about being (half) Asian and loving kabocha and mochi, but I feel like it’s part of my genetic makeup. I brought the whole batch to my mother’s house thinking maybe she’d take one or two squares, just to be polite, but she ended up taking the whole thing and stashing it in her freezer! Haha, I love that freezer, it’s an endless supply of god-knows-what deliciousness individually wrapped up in foil.